In part 5 the code was written to make sure that whenever a destination changes the recent destinations read model will update. Now that read model can be used to realise a view that a human can use. We'll add code to create a HTML view behind AWS cloudfront. This will demonstrate how event driven systems can be created by adding new code instead of changing existing code. DRY, in software developement, stands for Don't Repeat Yourself. This is often taken to mean remove any duplication of lines of code. Take this article from the front page of Google results. Or on this page that says "Every line of code that goes into an application must be maintained, and is a potential source of future bugs. Duplication needlessly bloats the codebase"
Often this is compared to WET code - which stands for Write Everything Twice. Reinforcing the idea that this is about the amount you type. Below we're going to look at what the impact of removing duplication of lines of code does to some software, hopefully demonstrate that it isn't desirable as an absolute rule, and show what the better way might be. In this post we start to see how we can build a stream of events that lets us create state. We'll do this by adding an event subscrber that waits until a user proposes a destination to visit and validates the location they've provided. In this post we will look at how SAM local let's you develop locally and write the first lambda function. To take a ProposeDestination command and write a DestinationProposed event to the eventstream. "SAM Local can be used to test functions locally, start a local API Gateway from a SAM template, validate a SAM template, and generate sample payloads for various event sources." After describing event-driven and serverless systems in part one it is time to write some code. Well, almost. The first task is a walking skeleton: some code that runs on production infrastructure to prove we could have a CI pipeline. 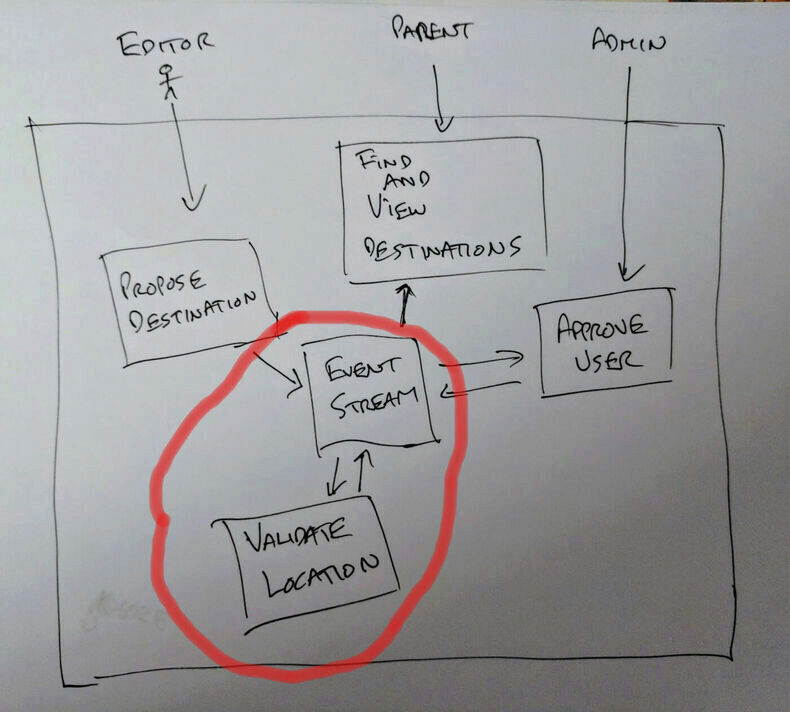 Putting authentication and authorisation to one side, because the chunk is too big otherwise, this task is to write a command channel to allow editors to propose destinations on the visitplannr system. This requires the set up of API Gateway, AWS Lambda, and DynamoDB infrastructure and showing some code running. But doesn't require DynamoDB table streams or more than one lambda. That feels like a meaningful slice. Anyone who knows me knows that I like to talk about Event-driven systems. And that I'm very excited about serverless systems in utility computing. I started my career in I.T. having to order network cables, care about fuses, and plan storage and compute capacity. It was slow, frustrating, and if you got it wrong it could take (best case scenario!) days to correct. Over a few articles I hope to communicate what serverless is, why you should find it exciting, and how to start using it. A way of measuring the progress being made by a software team. Not all teams use velocity. I've been on quite a few that do. So at least some teams still use it as a measure. …made a toot-storm about using construction as a metaphor for software engineering. 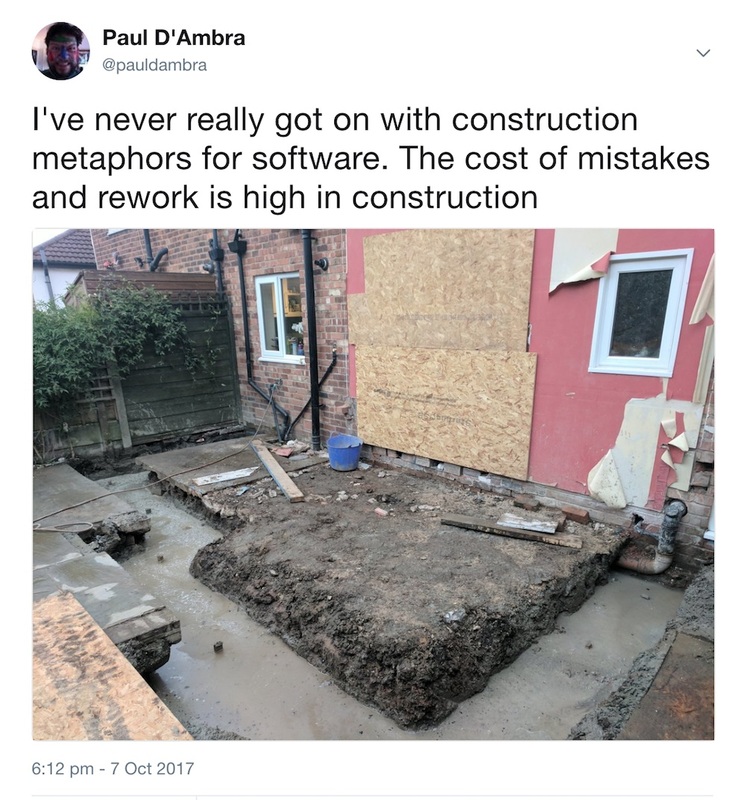 This isn't saying that Software isn't putting things together but rather I've seen people justify not 'being agile' by using construction metaphors. For our team's most recent retro we decided to try a new format to see how it affected our discussion. We thought we'd share it here in case it has value for other teams. A practice which has an XP team asking itself, at the end of each iteration : What went well ? What could be improved ? What could we experiment with ? We've recently had several discussions trying to focus on the real and perceived progress of our work and thought it would be beneficial to run the retro with a focus on the impact of our team's principles and practices. Specifically how they relate to delivery of value and speed of delivery.